A prestigious scientific organization on Oct. 11 called for more frequent and better inspections of freight railroad tracks to prevent potentially catastrophic oil and ethanol train crashes. A report by the National Academies of Sciences also urged better training for emergency workers and questioned the validity of recent train speed regulation. From 2005 to 2015, there were 21 derailments or collisions in the U.S. of trains hauling crude oil, resulting in the release of 1.6 million gallons. 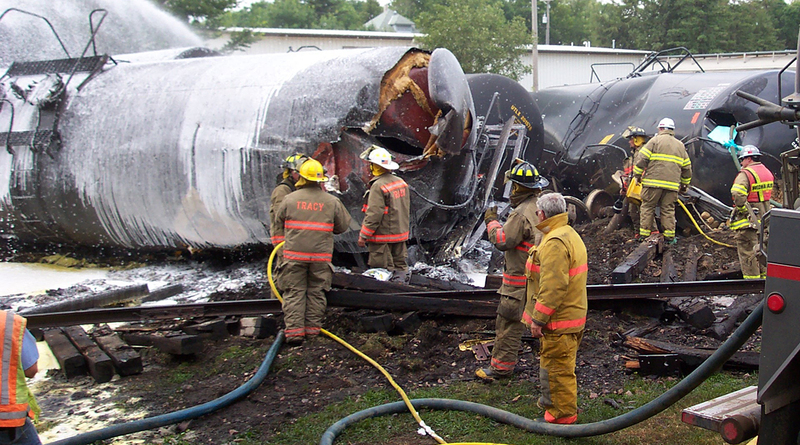 There were 58 ethanol train crashes over the same period, resulting in the release of 2.6 million gallons. The trains are often more than 100 cars long, and spilled oil or ethanol from ruptured tank cars has ignited and created giant fireballs that can last for days. Several derailments were attributed to track problems that weren’t detected in inspections shortly before the incidents. Federal regulations presume that inspectors won’t always catch all track problems, but the report questions whether there should be an acceptable failure rate. It suggests that these rates and priorities for track repair be adjusted for routes used by trains hauling crude oil and ethanol. The government should encourage railroads to make more frequent and comprehensive inspections of track on routes regularly used by oil and ethanol trains, including the use of advances in inspection technologies like sensors, high-resolution imaging and autonomous systems, the report said. Some railroads are using drones to increase track inspections. Derailments of all kinds reached an all-time low in 2016, said Jessica Kahanek, a spokeswoman for the Association of American Railroads. Derailments involving crude oil account for less than 1% of all derailments, she said. Railroads are already using many of the technologies mentioned in the report and are doing extensive research on ways “to make a safe network even safer,” Kahanek said. The report also questioned the technical basis for a recent safety regulation that reduced the maximum speed for oil trains to 50 mph in most areas and 40 mph in urban areas. Of the 20 most serious train wrecks in which oil and ethanol were released in the United States from 2005 to 2015, none of the trains were traveling faster than 50 mph and only six were traveling at 40 mph or more, the report said. Some safety advocates favor a 30 mph limit. The railroad industry opposes the lower speed, saying it would cause traffic jams and shipping delays. Emergency responders in many of the communities traversed by oil and ethanol trains, especially volunteer fire departments in rural areas, still lack familiarity with procedures for handling a large-scale incident involving highly flammable liquids, the report said. RELATED: New GPS technology will help keep freight trains from crashing. Why is it taking so long to arrive? Clear guidelines are also lacking on the kinds of information railroads should provide state and local agencies to prepare for such emergencies, the report said. And it’s unclear if the information railroads are sharing with state emergency planning agencies is getting to first responders. Oil and ethanol train derailments continue, although the pace has slowed. In June, 20 cars of a 115-car oil train derailed while passing through Plainfield, Illinois on its way to Louisiana. A tank car leaked 20,000 gallons of crude oil, most of which burned, following a collision in April between two trains near Money, Mississippi.